Oh, it's so beautiful and tender! Eager to see that! You have a wonderful gallery! Elena, How can I buy a copy of Summer in Doriath? I do not find it in the Deviantart shop. I really love this. The detail you added with the birds' wings is great. This is really so lovely and detailed! From the silver in Thingol's hair to the ornaments in their clothes, it all fits together so well and has such a soft and elegant feel to it. Great job! 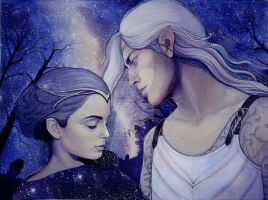 I love the look on Thingol's face! It may be a stupid question, but are you an official illustrator of Tolkien's books? I mean, do you cooperate with any publishing house? I'd be totally glad if my works could be included in Tolkien's books. I've been offering my illustrations to a couple of British publishers and I think of offering them to Russian and American publishers this year. I must tell you that I am a tolkienist and I really admire your work; it is an accurate reflection of all my imaginations and expectations caused by reading Tolkien. I find characters portrayed by you as full of pure beauty, wisdom and dignity. Thank you for your work! Thank you so much, your words means a lot for me! Really beautiful & inspiring work!!! Been a fan for awhile now. Congrats on being the daily dA today + you got my #Twitter feature #ArtistOfTheDay! Poor Melian, she was left all alone after Tingol died. 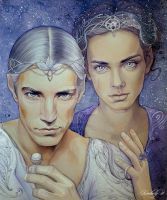 I'd like to suppose that they are reunited in Valinor)..
gorgeois. It's so beautiful and soft. A lot of people have said this, but this is just beautiful. I love how both of their expressions are displayed and I also love the detail in Melian's hair. I've also noticed a hint of white in Elwe's hair and I love how it gives that subtle highlight to the image. Great job once again!